It has been said that every religious heresy proceeds from a misunderstanding of the nature of God. Something similar could be said about constitutional heresies. They proceed from a misunderstanding of the nature of the Union. From the time the conservative intellectual movement emerged in the United States in the early 1950s, for example, its self-professed members have been divided into hostile camps who disagree sharply on the nature and meaning of the constitutional system that all federal office holders are bound by oath to support or uphold. The differences over constitutional interpretation reflect even more fundamental differences concerning human nature and man’s historical predicament. If men were angels, no government would be necessary. If angels were to govern men, neither external nor internal controls on government would be necessary. In framing a government that is to be administered by men over men, the great difficulty lies in this: You must first enable the government to control the governed; and in the next place, oblige it to control itself. To achieve the latter, the framers built into the new federal system a two-part set of checks and balances, many flowing from compromises mediating the conflicting interests of different states and regions. First, political power within the new general government would be divided among the legislative, executive, and judicial branches. Second, the overall power of the new government itself would be confined to the performance of certain enumerated purposes, with all other powers to be retained by the states or the people. The powers delegated by the proposed Constitution to the Federal Government, are few and defined. Those which are to remain in the State Governments are numerous and indefinite. The former will be exercised principally on external objects, as war, peace, negotiation, and foreign commerce…The powers reserved to the several States will extend to all the objects, which, in the ordinary course of affairs, concern the lives, liberties and properties of the people; and the internal order, improvement, and prosperity of the State. Madison added that the operations of the federal government would be most extensive during wartime and that the states would predominate in peacetime. Since peace would be the normal condition, the state government generally would have a more significant effect on the lives of the people than the central government. As mentioned, most intellectual conservatives have cherished the division of powers between the federal and state levels of government as providing a much-needed opportunity for individuals and groups to seek to advance their own and the common good in diverse and complex circumstances. However, a tight-knit faction of intellectuals influenced by the writings of Leo Strauss, many of whom consider themselves part of the conservative movement, has sought to diminish the importance of traditional restraints as supports for man’s moral quest, including the role of the states under federalism as a check on federal power. Harry Jaffa and his followers have been especially prominent among “Straussians” in insisting that to celebrate America is to celebrate, not constitutional restraint but radical revolution and innovation. Jaffa has argued that the Constitution should be interpreted not with reference to the explicit restraints on government, including federalism, approved by the framers and ratified by the people of the individual states. Instead, he asserts, it is to be interpreted with reference to the abstract principles set forth in the Declaration of Independence; in particular, that “all men are created equal” and that they are endowed with Lockean natural rights. In support of his position, Jaffa emphasizes his agreement with Abraham Lincoln that—unlike other nations held together by historical ties of religion, tradition, and common experience—the United States was “brought forth” in 1776 as “a new nation…dedicated to the proposition that all men are created equal:” a proposition described by Lincoln as “an abstract truth, applicable to all men and all times.” Jaffa also frequently stresses his agreement with Lincoln on another issue: whether the Union as now constituted pre-existed the states or vice versa. Arguing against the constitutionality of secession in his First Inaugural Address on the Fourth of March of 1861, Lincoln stated: “The Union is much older than the Constitution.” Later that summer, in his address to Congress, the new President said, “The Union is older than any of the States, and in fact it created them as States…Not one of them ever had a State constitution independent of the Union.” This is demonstrably false. 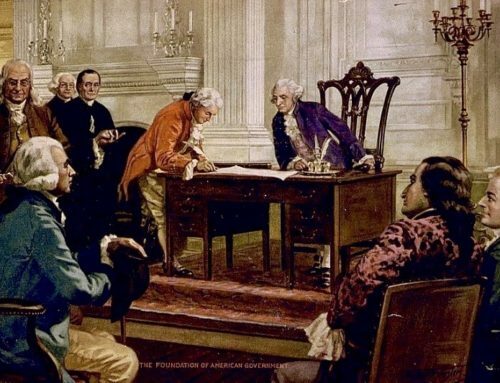 Virginia, for example, in her constitution of June 29th, 1776, declared that “the government of this country, as formerly exercised under the crown of Great Britain, is totally dissolved.” Virginia’s decision was prior to, and independent of the other colonies. Virginia had no way of forcing the other colonies to join her in her declaration, although she obviously hoped they would do so. If, however, the other colonies chose not to declare their independence, Virginia would have been on her own. The fact remains, however, that Virginia was independent before the other colonies. Perhaps Lincoln was unaware of Virginia’s history, or perhaps he was only speaking polemically. [The states] declared independence and union together, and there was never any time in which any state acted on the international sphere, having diplomatic relations—and the Constitution itself forbids each state to have any diplomatic action. They could not act independently of the other states in the international arena. His Britannic Majesty acknowledges the said United States, viz., New Hampshire, Massachusetts Bay, Rhode Island and Providence Plantations, Connecticut, New York, New Jersey, Pennsylvania, Maryland, Virginia, North Carolina, South Carolina and Georgia, to be free sovereign and independent states, that he treats with them as such, and for himself, his heirs, and successors, relinquishes all claims to the government, propriety, and territorial rights of the same and every part thereof. The Declaration, from Calhoun’s point of view, created not one union but a league of thirteen separate and independent states. All Confederate apologists, from Jefferson Davis and Alexander Stephens to the late Willmoore Kendall, would repeat this. But if viewing the United States prior to ratification of the Constitution as a league or alliance makes one a disciple of Calhoun, then Madison, when writing the Federalist papers, was such a disciple, even though Calhoun at that time was but five years of age. In direct contradiction to Jaffa’s position— and Lincoln’s—Madison, in Federalist 43, raised the question: “On what principle the Confederation, which stands in the solemn form of a compact among the States, can be superseded without the unanimous consent of the parties to it?” In response, Madison observed that the union under the Articles of Confederation was based on a “compact between independent sovereigns, founded on ordinary acts of legislative authority” that were subject to repeal at any time. Hence, the confederation, according to Madison, could “pretend to no higher validity than a treaty or league between the parties,” i.e., a treaty among independent states such as the present-day NATO alliance. Yet Jaffa, in his book A New Birth of Freedom, argues that no state ever acted independently of the others. The remainder of this inquiry will examine the veracity of that assertion, with primary attention to the two states that did not ratify the Constitution until after George Washington’s inauguration as president and the convening of the First Congress. The stories of the states of North Carolina and Rhode Island, the “Wayward Sisters,” throw much light on the status of non-ratifying states during the transition from a union under the Articles of Confederation to one under the Constitution. The Wayward Sisters have something to teach us of the nature of the Union itself. The people of the states were dissatisfied with the Articles of Confederation, and, after the abortive attempt to draft a replacement document at Annapolis in 1786, representatives from the several states assembled in Philadelphia in the summer of 1787—the only exception was Rhode Island, the people of which seem to have been less dissatisfied than their compatriots. This was a bit of a problem, since the Articles of Confederation required unanimity for any amendment to take effect. The absence of Rhode Island was not a good omen for the success of any arrangement that the Philadelphia Convention might produce. The members got to work, however, and hoped for the best. The Committee on Style drafted the Constitution with key blanks for the Committee of the Whole to debate, vote on, and fill in. When the Committee of the Whole reached Article VII, the draft read, “The ratifications of the Conventions of ___ States shall be sufficient for organizing this Constitution.” Federalists James Wilson of Pennsylvania and Edmund Randolph of Virginia suggested seven, eight, or nine, the latter “being a respectable majority of the whole, and being a number made familiar by the constitution of the existing Congress.” The more conservative members, such as Roger Sherman of Connecticut, John Dickinson of Delaware, and Daniel Carroll of Maryland reminded the Committee that amending the Articles of Confederation required unanimity among the states. So, what came of this exchange? First, the urgency of the case caused the members of the Philadelphia Convention to jettison the Articles of Confederation’s requirement for unanimity. They all knew that Rhode Island was so disinterested in reforming the Articles of Confederation that she refused to even send representatives to Philadelphia. This, however, did not prevent the others from “referring to the original powers of society” and “consulting their safety.” Next, they established that only those states which wanted into the new arrangement would be bound by it. In other words, given a choice between keeping the Union together as a unit, or allowing the people of each state to have their own decision, they chose the latter. They were willing to break up the Union if necessary in order to get the new Constitution adopted by those who wanted reform. The Philadelphia Convention reported to Congress in September of 1787. Congress sent the Constitution to the states for their approval or rejection. 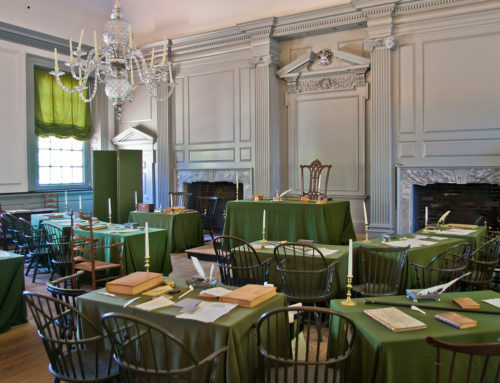 Delaware, Pennsylvania, and New Jersey adopted the Constitution in December. They were followed by Georgia, Connecticut, Massachusetts, Maryland, and South Carolina. When New Hampshire ratified in June of 1788, that made nine and the Constitution would go into effect between the ratifying states. The Final Four were Virginia, New York, North Carolina, and Rhode Island. The Anti-Federalist opposition, while never a formal party with a common plan of action, had frequently rallied around the idea of rejecting the Constitution and drawing up another one, a better one. Federalists in the state conventions, especially those such as James Madison, James Wilson, and Charles Cotesworth Pinckney, who had seen firsthand at Philadelphia how difficult it was to get this Constitution drafted, rejected this reasoning. They worked to get this one ratified and then, if changes were needed, the amendment procedure could be used. With the ratification of New Hampshire, Anti-Federalists were faced with two stark choices: they could ratify in the hope that amendments would fix the flaws they saw in the Constitution, or they could reject it and know that their rejection would mean ejection from the Union. In every ratification instrument of the Final Four, Federalists agreed to append to the ratification instruments a set of proposed constitutional amendments. In every one of these cases, the final vote on ratification had been close. Appending amendments had won over enough fence-sitters to secure adoption of the Constitution. The ratification of New Hampshire had set in motion the machinery that would activate the Constitution in March of 1789. The subsequent ratifications of Virginia and New York carried little impact for our purposes here, since the new government under the Constitution would not be elected until the winter of 1788-89 and would not sit until March of 1789. The cases of North Carolina and Rhode Island, however, merit some attention. North Carolina’s Convention had considered the Constitution and declined to ratify it by a margin of 183-83. In March of 1788, the voters of Rhode Island had voted overwhelmingly against even holding a State Convention to consider the new Constitution. Meanwhile, the old Union ground slowly to a halt. The Continental Congress died in a manner similar to that of a boring dinner party. After enacting ordinances for the transition to the new government under the Constitution, the members gradually drifted away. The last official business was transacted on October 10th, 1788. Thereafter, a quorum was not present. 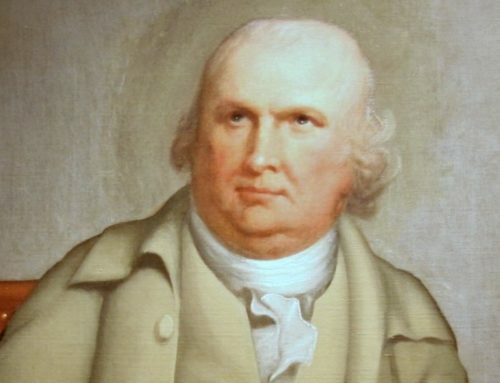 November Third was the last date on which a North Carolina representative was present, and February 12, 1789, was the last time a Rhode Island representative sat. The new Congress under the Constitution had been directed to assemble on March Fourth, but it was not until April First that a quorum was present. President Washington did not turn up for his inauguration until April Thirtieth. During this time, it would seem that North Carolina and Rhode Island were on their own, as independent states. Their votes are not counted in the electoral college of 1788. They elected no representatives to the new bicameral Congress. Washington responded in kind. Since the North Carolina legislature had just called for a second state convention to consider the Constitution, President Washington wrote to Governor Johnston, “I most earnestly implore the divine benediction and guidance in the Counsels, which are shortly to be taken by their Delegates on the subject of the most momentous consequence, I mean the political relation which is to subsist hereafter between the State of North Carolina and the States now in union under the new general government.” Obviously, Washington and Governor Johnston both considered that North Carolina was not in the Union prior to ratification. As for Rhode Island, Washington’s correspondence also shows that he considered the little state to be out of the Union. In a letter to Governor Morris in October of 1789, Washington wrote, “it is hoped . . . that the non-acceding States will very soon become members of the Union. No doubt is entertained of North Carolina; nor would there be any of Rhode Island, had not the majority of those people bid adieu, long since, to every principle of honor, common sense, and honesty.” Obviously, Washington saw Rhode Island as being out of the Union in October of 1789, although he did not care much for the conduct of the people of that state. John Collins, the Governor of Rhode Island, also wrote to Washington in September of 1789 that, “although they (the people of the state of Rhode Island) now stand as it were alone, they have not separated themselves or departed from the principles of that confederation, which was formed by the sister States in their struggle for freedom, and in the hour of danger.” Further, Collins wrote, “we earnestly look for the time, when they may with clearness and safety be again united with their sister States.” Rhode Island, Collins believed, might yet hold a state convention to consider the Constitution and join the Union. In the meantime, Collins wrote, “we are induced to hope, that we shall not be altogether considered as foreigners, having no particular affinity or connexion with the United States; but that trade and commerce, upon which the prosperity of this State much depends, will be preserved as free and open between this and the United States, as our different situations at present can possibly admit.” Thus, like North Carolina, both Washington and the governor proceeded on the assumption that Rhode Island was no longer in the Union. The status of North Carolina and Rhode Island is also confirmed in statutes passed in the first Congress. The Federal Judiciary Act of 1789 established Federal courts subordinate to the Supreme Court of the United States in thirteen districts. One per each of the eleven states at that time, except Virginia and Massachusetts, which had two judicial districts (one each for Maine and Kentucky). In other words, the Judiciary Act of 1789 did not apply to the outliers, North Carolina and Rhode Island. Once the outliers joined the Union, the Judiciary Act had to be amended to create a judicial district for them: This was done for North Carolina and Rhode Island in June 1790. Ultimately more influential, both in its effects on the states in the Union and without, in getting the outliers to join were the series of laws regulating trade. On July 20th, 1789, Congress set the Federal tonnage duty, which charged American-made, American-owned ships at five cents per ton, American-made but foreign-owned ships thirty cents per ton, and foreign-made, foreign-owned ships fifty cents per ton. This tax was to take effect on September 1st, 1789, and no exception was initially made for ships owned by citizens of Rhode Island and North Carolina. If these states were somehow in the Union, this law would have been unconstitutional. On September Sixteenth, however, Congress extended to citizens of North Carolina and Rhode Island the same privileges as American citizens, at least until January 15th, 1790. On July 31st, 1789, Congress passed “an Act to Regulate the Collection of Duties.” This law defined the ports of entry into the United States, established the customs duties, and the procedures for their collection. Goods imported into the United States through Rhode Island and North Carolina were taxed as if they were imported directly from overseas. “Goods, wares, and merchandise” made in Rhode Island and North Carolina were exempt from duty, as if these two states were in the Union. The Wayward Sisters, however, did not return the favor. North Carolina collection officials were collecting customs duties, but, prior to North Carolina’s ratification, the funds collected were not made available to the United States Treasury. On November 30th, 1789 (i.e., after North Carolina’s ratification), the North Carolina House of Commons had started reading a bill directing North Carolina “to collect the [imposts and duties] for the use of this State, until the Congress of the United States shall make provision for that purpose.” On December 17th, 1789, the North Carolina House of Commons acknowledged that North Carolina had been collecting duties as early as April of 1789. In a petition dated December 9th, 1789, Francis Perrymant and Thomas Amis observed that the duties on merchandise had been “secured to the State.” Further, in February of 1789, John Bradley, John Ingram, and George Hooper had shipped merchandise from England to Charleston, South Carolina. Here, they had paid the United States duty on the goods, they then trans-shipped the merchandise to Port Brunswick, North Carolina where the merchants were obliged to post bonds guaranteeing payment of the North Carolina import duty. On December 19th, 1789, since North Carolina had now joined the Union, the merchants asked North Carolina to cancel the bonds paid for the North Carolina duties. The General Assembly agreed not to require payment of the bonds posted until its next meeting. If, by that time, North Carolina “is to participate of the Congressional duties secured to be paid as aforesaid, then in such case the said Bonds shall be cancelled and made void, otherwise the same shall be collected as other State duties.” In other words, North Carolina suspended payment until federal customs arrangements were normalized. Implicit in this is the acknowledgment that there were “state duties” being collected, a thing that would have been unconstitutional if North Carolina were in the Union at the time. Although the two outlying states were recognized as out of the Union, Congress had specifically exempted the citizens of these two states from some (but not all) of the liabilities of no longer being citizens of the United States. Congress had suspended the economic measures to maintain an extended hand of friendship to their former countrymen, and to avoid antagonizing them as they considered the political and economic benefits of joining the Union. They need not have bothered in the case of North Carolina. In the summer of 1788 the major objection of Old North State’s Anti-Federalists had been the lack of a Bill of Rights. By the summer of 1789 Congress had adopted such a Bill of Rights and sent it to the states for ratification. This fact, plus the fact that someone as trusted and well-respected as George Washington had been elected President, removed Anti-Federalist objections. The second North Carolina Convention, assembled in Fayetteville in November of 1789, ratified the Constitution and joined the Union. Congress moved quickly to economically embrace the newest member of the Union in February of 1790 by retroactively amending tonnage, duty, and navigation acts to read as if North Carolina had been a member when these acts had originally passed. The Congress of the United States do resolve and declare it to be their most earnest desire, that the Legislatures of the State of Rhode Island and Providence Plantations, do recommend to the people of that State to choose delegates to meet in convention, and to whom the constitution of the United States is to be submitted, conformably to the unanimous resolution of the United States in Congress assembled of the 28th of September 1787. I should be glad to know if any gentleman considers the state of Rhode Island dissevered from the Union; a maritime State, situated in the most convenient manner for the purposes of smuggling, and defrauding our revenue. Surely a moment’s reflection will induce the House to take measures to secure this object. Do gentlemen imagine that state will join the union? If they do, what is the injury arising from the adoption of the resolution intended to be submitted to the committee [Mr. Benson’s]? Is there any impropriety in desiring them [Rhode Island’s citizens] to consider a question which they have not yet decided? It has been suggested, by an honorable gentleman [Madison], that this desire will operate as a demand. If a wish of Congress can bring them into the Union, why should we decline to express such a wish? It has been said, that Rhode Island has never called a convention; the other States have. Then why should we decline to request them to do what every other State has been called upon to perform? The gentleman from Virginia seems afraid we should sacrifice our dignity by making this request. Let it be remembered, Great Britain lost her colonies by sacrificing her interest to her dignity. We ought, therefore, to be careful how we act upon ideas of this kind. There seems some disposition on that State to join her sister States in adopting the constitution. Then, why shall we decline encouraging that good spirit by approving the measure? Congress decided to wait and not invite Rhode Island to specifically hold a state convention. The majority wanted to allow Rhode Islanders to see for themselves the benefits of the Union and decide for themselves based on the relative benefits and liabilities of membership.—this was an example of the tenderness of the framers and their contemporaries toward the feelings of former member states of the Union. Obviously, at this time, the majority of the House felt that the decision to become a member of the Union should be left entirely to the citizens of the state to consider, free from any outside interference. Meanwhile, other economic factors would be developing in such a way as to force Rhode Island to join the Union. On January 14th, 1790, Alexander Hamilton presented his proposal to Congress that the Federal government assume the debt, which the states had incurred in fighting the American Revolution. In Congress, there were supporters of the proposal (mainly Federalists) and detractors (mainly Madison and the Virginians). One side of the issue was what to do with Rhode Island’s share of the national debt: $27,000. In March, the Rhode Island Convention met, debated the Constitution, and adjourned without adopting it, but agreed to meet again on May Twenty-Fourth in Newport. Congressional patience with Rhode Island grew thin. On May Eleventh, the U.S. Senate debated a bill that would prohibit all commerce with Rhode Island and would authorize the President to demand that Rhode Island pay her $27,000 share of the national debt incurred during the Revolution. Of course, if Rhode Island were still somehow part of the Union, the trade prohibition would have been unconstitutional. The Rhode Island resolutions were taken up. I was twice up against these resolutions. They admitted on all hands that Rhode Island was independent, and did not deny that the measures now taken were meant to force her into adoption of the Constitution of the United States; and founded their arguments on our strength and her weakness. I could not help telling them plainly that this was playing the tyrant to all intents and purposes. Mr. Lee opposed it in a long and sensible speech. Butler blustered away, but in a loose and desultory manner. King, Elsworth [sic], Strong, and Izard spouted out for it. It was long before there was a slack. As this was to be the last reading, and as the yeas and nays would, in my opinion, be called, I took what I thought was new ground. The Bill had been assigned to various motives, self-defense, self-preservation, self-interest, etc. I began with observing that the Convention of Rhode Island met in a week; that the design of this bill was evidently to impress the people of Rhode Island with terror. It was an application to their fears, hoping to obtain from them an adoption of the Constitution, a thing despaired of from their own free-will or their judgment. It was meant to be used in the same way that a robber does a dagger or a highwayman a pistol, and to obtain the end desired by putting the party in fear; that where independence was the property of both sides, no end whatever could justify the use of such means in the aggressors. I therefore was against the bill in every point of view, etc. The debate was long. I was up a second time, but to no avail. The question was put at about three o’clock and carried. The bill went to the House for debate, but the Senate’s message to Rhode Island was clear: join the Union, or pay the consequences. On May Twenty-Ninth, the Rhode Island convention voted narrowly to ratify: thirty-four to thirty-two. On one level, this inquiry is about the functioning of self-determination and creation of a federal republic despite the centrifugal and centripetal forces of politics. Obviously, the Founders wanted the people of the states to have control over the decision to join the Union or not. Initially, many in Congress were opposed to even issuing a second invitation to Rhode Island to hold a convention to consider ratification. Over time, however, the reluctance waned and Federalists managed to bring some substantial pressure to bear on Rhode Islanders. Ultimately, however, the choice was up to the people of Rhode Island, just as it had been up to the people of every state. It would be a grave mistake to confuse eventual unanimity among the states for inevitable unanimity. As a guide in expounding and applying the provisions of the Constitution, the debates and incidental decisions of the [Philadelphia] Convention can have no authoritative character…[T]he legitimate meanings of the Instrument must be derived from the text itself; or if a key is to be sought elsewhere, it must be…in the sense attached to it by the people in their respective State Conventions, where it received all the authority which it possesses. The story of the Wayward Sisters helps us put an appropriate emphasis where the framers intended: on the State Conventions. Further, the story of the Wayward Sisters has some relevance to contemporary debate. If, as the record shows, the non-ratifying states were independent until they did ratify, then a main support for Harry Jaffa’s apotheosis of Abraham Lincoln is fatally undermined. Lincoln was not courageously maintaining a sacred Union, but actually was ruthlessly violating the framers’ principles about the consent of the governed in the question of membership in the Union. The record illustrates two important aspects of the ratification period. First, the story of the Wayward Sisters shows conclusively that everyone involved agreed that non-ratifying states were not in the Union. There was no single bit of evidence that showed that anyone in a position of authority believed that these two states were somehow in the Union between April of 1789 and their respective ratifications. Second, it demonstrates the extreme tenderness of the framers to the feelings of the peoples of the non-ratifying states. They were reluctant to even invite them a second time to hold a convention to consider the Constitution. Madison and Page felt it should be adopted only on its own merits, not any threat of punishment or promise of benefit from the United States. Membership in the Union, as far as the framers were concerned, was up to the people of the respective states. President Lincoln was simply incorrect in his pronouncements that the Union was older than the states. Harry Jaffa is equally incorrect in his conclusions about the status of the non-ratifying states prior to their ratifications. They were indeed independent of the Union, and, more importantly, they were seen as such by the political leaders of these states and of the federal government at the time. Lastly, this is not some esoteric academic argument. Should the United States hold another Constitutional Convention in the future and adopt an article similar to the current Article VII, the status of non-ratifying states would be as momentous as it was in 1789-1790. If the same proportion were used, then the new Constitution would go into effect when thirty-five states ratified and would be between those thirty-five, leaving fifteen states out of the Union. Having a proper understanding of what happened the last time the United States redrafted its constitution could be extremely consequential. The Wayward Sisters have shown the way, and perhaps, in the debate over some future Constitution, being a future Wayward Sister would be a way to leave the Union peacefully. This would apply, however, only if we accurately remember the cases of North Carolina and Rhode Island between 1789 and 1790. Books on the topic of this essay may be found in The Imaginative Conservative Bookstore. Republished with gracious permission of Humanitas. 1. As Claes Ryn has written, “Jaffa has made a career of asserting that America must not, repeat, not, be understood as owing anything of importance to an old historical heritage. It must be seen as born out of a radical break with the past and as based on abstract principles of an essentially Lockean cast— Lockeanism understood concomitantly as a departure from earlier thought. The American Founding, Jaffa asserts, ‘represented the most radical break with tradition…that the world had seen…T]he founders understood themselves to be revolutionaries, and to celebrate the American Founding is therefore to celebrate revolution.’ The American Revolution ’embodied the greatest attempt at innovation that human history had recorded.’ This revolution was somewhat mild, Jaffa concedes, but belongs with ‘subsequent revolutions in France, Russia, China, Cuba or elsewhere.’” Claes G. Ryn, “Allan Bloom and Straussian Alienation,” Humanitas 25:1&2 (2012), 7-8. The Jaffa quotations are taken from Harry V. Jaffa, “Equality as a Conservative Principle,” in William F. Buckley, Jr., and Charles R. Kesler, eds. Keeping the Tablets: Modern American Conservative Thought (New York: Harper and Row, 1988), 86. 2. Harry Jaffa, “What Were the ‘Original Intentions’ of the Framers of the Constitution of the United States?” University of Puget Sound Law Review (Spring 1987), 364. 3. Lincoln’s Gettysburg Address, November 19, 1863; Abraham Lincoln, Letter to Henry L. Pierce and others, April 6, 1859. 4. First Inaugural Address of Abraham Lincoln, March 4, 1861, (accessed 25 July 2014). 5. Lincoln’s address to the Congress of 4 July 1861, Roy Basler (ed. ), Collected Works of Abraham Lincoln. Volume 4 (New Brunswick, N.J.: Rutgers University Press, 1953), 434-435. 6. Kevin R. Gutzman, Virginia’s American Revolution: from Dominion to Republic, 1776-1840, (Lanham, Md: Lexington Books, 2007), 31. 7. http://www.independent.org/events/transcript.asp?eventID=9#02, accessed 4 March 2012. Emphasis added. 8. The Paris Peace Treaty of September 30, 1783, (accessed 25 July 2014). 9. Harry Jaffa, “What Were the ‘Original Intentions‘ of the Framers of the Constitution of the United States?”, 368. In the same article Jaffa criticized Russell Kirk, whom he called “the greatest of all gurus of contemporary American conservatism,” for having “pursued the path of Calhoun” (380). Others denounced by Jaffa for agreeing with Calhoun included “[Irving] Kristol, [Robert] Bork, [Jeane] Kirkpatrick, and the whole tribe of present day conservative publicists” (Ibid.). 10. Harry Jaffa, A New Birth of Freedom (New York: Rowman & Littlefield Publishers, 2000), 256. 11. Sol Bloom applied the term “Wayward Sisters” to North Carolina and Rhode Island in his sesquicentennial work, History of the Formulation of the Union under the Constitution (New York: Greenwood Press, 1968), 468. 12. Article XIII, Articles of Confederation. 13. James Madison, Notes on the Federal Convention of 1787 Reported by James Madison (New York: Norton, 1987), 561. 17. Massachusetts, South Carolina, and New Hampshire had all attached recommended amendments or caveats clarifying their understanding of the Constitution in ratifying it. 18. The vote was 89-79 in Virginia, 30-27 in New York, and 34-32 in Rhode Island. North Carolina, after refusing to ratify the Constitution in 1788 by a vote of 183-83, adopted the Constitution in 1789 by a vote of 194-77. See Bernard Bailyn (ed. ), Debate on the Constitution (New York: Library of America, 1993), vol. 2, 1068 and 1072. 19. Bailyn, Debate on the Constitution, vol. 2, 1069. 20. Theodore Foster, Minutes of the Rhode Island Convention of March 1790 (Providence: Rhode Island Historical Society, 1929), 14. Cited hereafter as Foster’s Minutes. 21. Journal of the Continental Congress (Washington: Government Printing Office, 1937), vol. 34, 601. 22. Ibid., vol. 34, 604 and 605. 23. Annals of Congress, House of Representatives, 1st Congress, 1st Session (Washington: Gales and Seaton, 1834), vol. 1, 100 and 242. 24. State Gazette of North Carolina, June 4, 1789. Emphasis added. 25. Sol Bloom, History of the Formulation of the Union under the Constitution, 478. Emphasis added. 26. Ibid., 479. Emphasis added. 27. Jared Sparks (ed. ), Writings of George Washington (Boston: Russell, Shattuck and Williams and Hillard, Gray and Co., 1836), vol. 10, 39. Emphasis added. 28. Ibid., vol. 10, 487-489. Emphases added. 29. United States, Public Statutes at Large (Boston: Little, Brown, 1845), vol. 1, 73. 30. Ibid., vol. 1, 99 and 128. 31. Ibid., vol. 1, 27. 32. Ibid., vol. 1, 69. 33. Ibid., vol. 1, 48. 34. Walter Clark (ed. ), State Records of North Carolina (Goldsboro: Nash Brothers, 1908), Volume 21, 240, Minutes of the North Carolina House of Commons, 14 November 14, 1789, or prior to North Carolina’s ratification and joining of the Union. 35. Ibid., 285 (November 30), 293 (December 1), 318 (December 5), 321 (December 7), 352 (December 12) and 365 (December 15). (Italics added.) 36. Ibid., 388. 37. Ibid., 408. 38. John R. Bartlett (ed. ), Records of the Colony of Rhode Island and Providence Plantations (Providence: Providence Press Co., 1865), vol. X (1784-1792), 331. 39. Ibid., 340. 40. United States, Public Statutes at Large, vol. 1, 99. 41. United States Department of State, Documentary History of the Constitution of the United States, Part 2 (Washington: United States Department of State, 1905), 240. 42. Annals of Congress, House of Representatives, 1st Congress, 1st Session, vol. 1, 437. 43. Ibid., vol. 1, 439. 44. Ibid., vol. 1, 440. 45. Ibid., vol. 1, 439-440. Emphasis added. 47. Bloom, History of the Formation of the Union under the Constitution, 494. 50. Edgar Maclay (ed. ), Journal of William Maclay (New York: D. Appleton & Co., 1890), 259. Emphasis added. 51. Edgar Maclay (ed. ), Journal of William Maclay (New York: D. Appleton & Co., 1890), 266-267. Emphasis added. 52. See the remarks of James Iredell in the North Carolina Convention, Jonathan Elliot (ed. ), The Debates in the Several State Conventions on the Adoption of the Federal Constitution (Washington: Jonathan Elliot, 1836), Vol. IV, 142-143. Called Elliot’s Debates hereafter. 53. Elliot’s Debates, vol. III, 38. 54. Letter to Thomas Ritchie, September 15, 1821, in James Madison, Letters and Other Writings of James Madison (Philadelphia, J. B. Lippincott, 1865), vol. III, 228. 55. There is no requirement that any future Constitutional Convention would have to conclude a proposed new Constitution with an article similar to the current Article VII, but if it did copy the style of the Constitution of 1787, then the precedents of 1789-1790 would be important. Jonathan White teaches history at the Virginia Military Institute. He is a doctoral candidate in history at the University of Alabama. Jaffa was being disingenuous if he claimed that Calhoun was the only source for state reserved powers; surely he had heard of John Taylor of Caroline who preceded Calhoun and helped Madison and Jefferson in the Kentucky and Virginia Resolutions. This is a very useful article. It should be noted that North Carolina actually initially voted against ratification, which denotes the genius of the state and its citizens as an intermediary response. It is also helpful to affirm the excesses of Professor Jaffa, which deserve serious critique (see http://www.libertylawsite.org/2015/01/26/how-jaffas-critics-remember-him). A wonderful writing. It is also interesting in mentioning the vaut rien comment of Jefferson (in his letter to Lafayette who was a friend of Rhode Island) in having the pomp of the visitation of L’Hermione in Newport this summer.